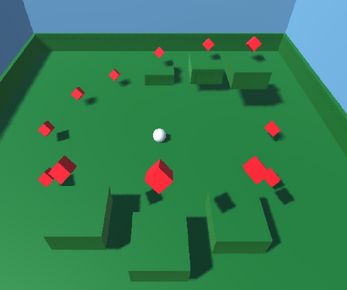 Use the arrows keys (move) and space bar (jump) to help one white ball achieve its dream of collecting all 12 magic red cubes! This was a Unity tutorial I made and modified on my own. I added in code to make our spherical hero jump, added walls to prevent the player from falling off the world, added in platforms to give the player more of a challenge and added in code to make the platforms move up and down.